If you already have design resources and are looking for a crack team of HTML and CSS coders, we're ready for you. Our flexible model allows us to fit seamlessly into an existing relationship. Taking Photoshop, Illustrator files and producing them in clean, fast code. Helping out with higher-level tasks like Information Architecture, visuals and graphics or just staying out of your way. 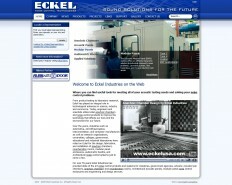 Eckel Acoustic had several websites for each location. We helped them unify their identity and gave them a clean new look.